highlights the evolution of the craft field as it transitions into a new phase at the hands of contemporary artists. The permanent collection returns to the Renwick Gallery with a dynamic new presentation of 80+ objects celebrating craft as a discipline and an approach to living differently in the modern world. The installation includes iconic favorites alongside new acquisitions made during the museum's renovation, which will be displayed at the museum for the first time. Nora Atkinson, The Lloyd Herman Curator of Craft, selected the objects and conceived the innovative presentation. Brooch/Pendant, 2001 - on display. 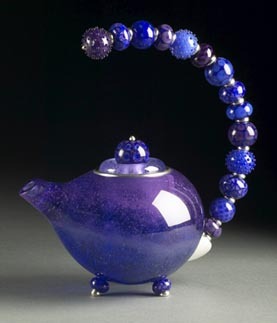 Flameworked glass (circular cobalt/silver bead with dots), sterling silver with tiny dots, 2 3/4"
Jewelry by Artists: The Daphne Farago Collection Exhibition presented selected highlights from Daphne Farago's outstanding collection of contemporary craft jewelry gifted to the MFA.